The Benko is a powerful weapon in any player�s Black repertoire. However, many white players, fearing black activity and compensation, decide to avoid it altogether before Black has the chance to sacrifice his pawn. This DVD offers a complete repertoire for black players after 1.d4 in the case that White avoids the move 2.c4 or after 2.c4 c5 avoids the move 3.d5. Additionally, you will find good and aggressive black alternatives against 1.Nf3 and 1.c4, allowing you to have a full repertoire against any 1.d4 player, no matter what their move order is. 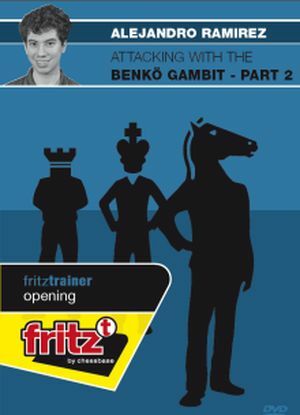 The variations chosen in this DVD will be helpful not only to Benko players, but anyone that wants to battle systems such as the Zukertort, Colle, Trompowsky, the English and many others. The DVD was made with the spirit of the Benko in mind, so the lines chosen will suit positionally aggressive players perfectly.